Birthdays—at my age, they are just another day in our gradual and inevitable march through time, but my one pleasure in marking my incremental increase in years is eating cake. Cake is my favorite food, and I’ve mentioned it in other blogs before, but since I had a blog due on my birthday this year, I decided to exploit the situation for my own advantage and write about this exquisite dessert. Cake is an iconic, beautiful marker of momentous occasions and our biggest celebrations: birthdays, weddings, anniversaries, and graduations. Birthday cakes have a long history in Europe, where they began as fruitcakes. The modern layered birthday cake became popular in early America where there were fewer bakeries and home bakers used layers to make taller cakes more quickly (Byrn 2016:266). Although bakeries are more plentiful now and bake many birthday cakes, they carry on the tradition of being tall, layered spectacles. Check out the awesome options offered on campus by MSU Bakers! Anniversary celebrations also frequently include cake. 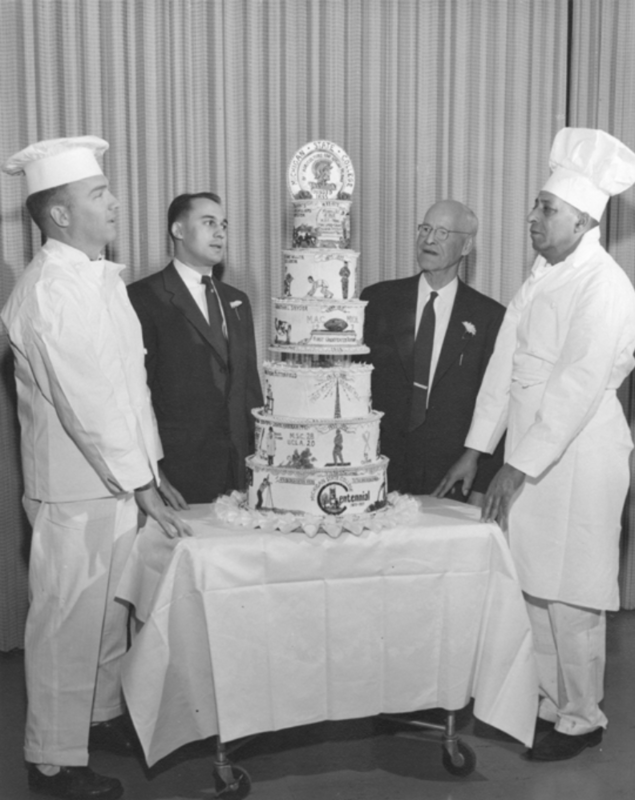 For its centennial anniversary in 1955, MSU had a large and ornate layered cake made. For MSU’s sesquicentennial (150th) anniversary in 2005, the Dairy Store released an ice cream flavor that remains a favorite today: Sesquicentennial Swirl. It is vanilla ice cream with white cake and green frosting swirls. Cake evokes such feelings of communal celebration that it was incorporated into this celebratory flavor. Last year I wrote about an 1884 banquet held for the MSU class of 1886. They served ten (10!) different types of cake at this occasion, including chocolate (my personal favorite). My perusals of earlier cookbooks found they rarely included chocolate cake, and it only became popular in the 1880s after companies like Hershey arose and railroads facilitated travel and the spread of ingredients and ideas. The first chocolate cake recipe wasn’t published in the US until 1886 (Burn 2016:68), so these MSU students were ahead of the curve! Although cake can act as a public symbol of jubilation, it can also play an important role in everyday life. As much as I enjoy birthday and wedding cake, so do I enjoy grabbing a coffee and cupcake with a friend, or enjoying a slice at home by myself when relaxing after a long week. It is these little moments that do not get captured in photos posted in the newspaper, but instead these are moments captured in the memories of students as part of their experiences here at MSU. The earliest mention I can find of cake on campus is from the diary of Edward Granger in 1858. On Christmas Eve he wrote, “12 o’clock (midnight) Mr. Charley and Bush have just returned from an expedition to the lower regions. The booty consists in about a peck of fried cakes, to a portion of which we have been giving ample justice” (UA10.3.56, Folder 1). Whether these fried cakes were more like donuts or johnny cakes we cannot be sure, but it’s obvious that these scandalously-procured items were a sinful treat for these mischievous college students. Granger also revealed an affinity for ginger treats, which inspired the ginger cake we served at our 1860s meal reconstruction last spring. One of the most entertaining accounts of cake come from Maurice Grenville Kains in a memoir from the Michigan State College of Agriculture Class of 1895. He recounts a take from Boarding Club A, when the notorious Joe Bush would sneak into the dining hall before everyone else so that he could position the pie or cake of the day near his seat so he could choose the biggest piece and also assure that he would get a second piece once the dessert was passed back around. His fellow students grew tired of his hijinks and delayed him from entering early one day, and “when he saw his place, the whole room burst into a roar of laughter; for beside his plate was a little pig trough!” (Kains 1945:135). The Anna E. Bayha Home Management House was one of four buildings on campus built to give women students the task of living in and running their own homes (see Lisa’s post from a few years ago for more information). Each year, the Bayha House residents made photo albums documenting both everyday and special events that went on in the house. 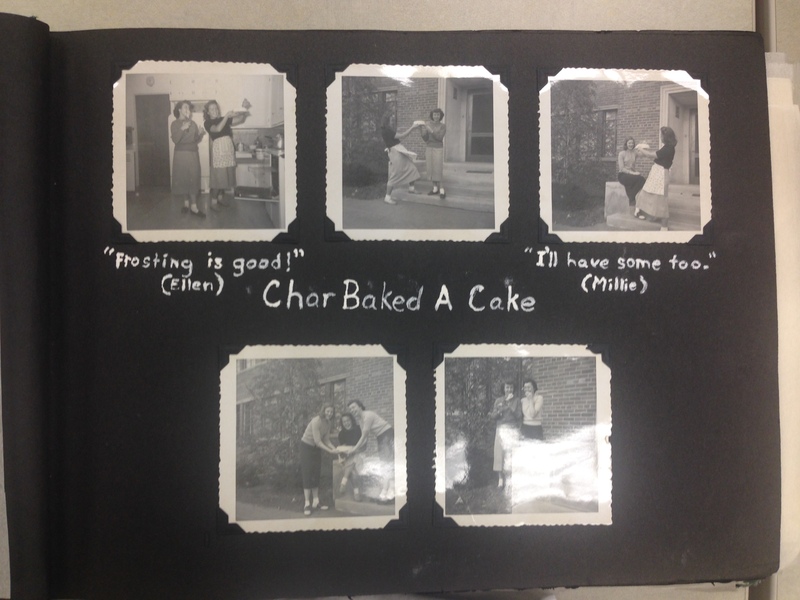 In the Fall 1949 Album is a delightful page titled “Char Baked a Cake” with comments such as “frosting is good!” inscribed on the page (UA.15.3, Vol. SB10, Scrapbook 10, 1947-1953). This is a lovely peek into the lives of women on campus, and it appears they enjoyed both baking and eating their culinary creations. The Bayha scrapbooks even provided us with a clue to an archaeological mystery on campus. CAP found pieces of distinctive plates with raised edges at the Gunson trash pit. 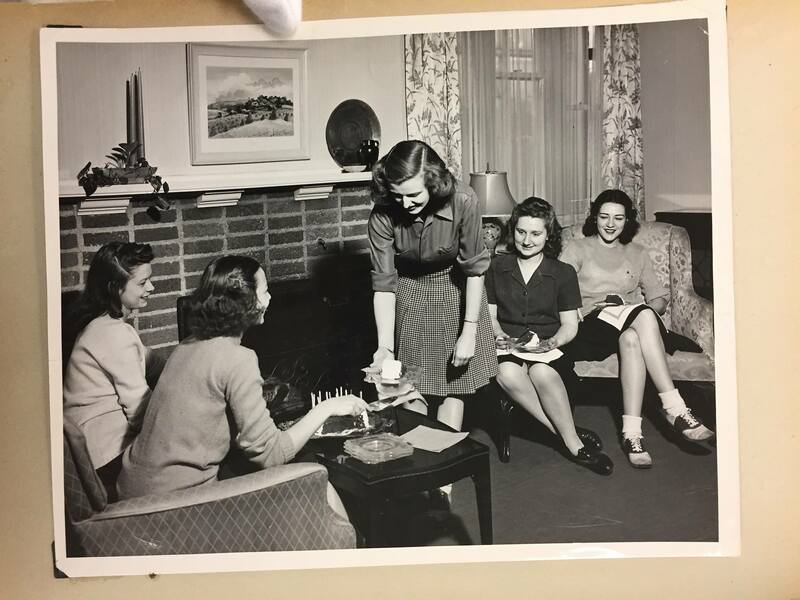 The Gunson house later became the Bayha House, and a photo from the 1946 scrapbook shows the ladies serving cake on the same style plates! We do, however, know that this type of plate was likely used for serving cake and other desserts, and may have been specially reserved to function as cake plates on campus. 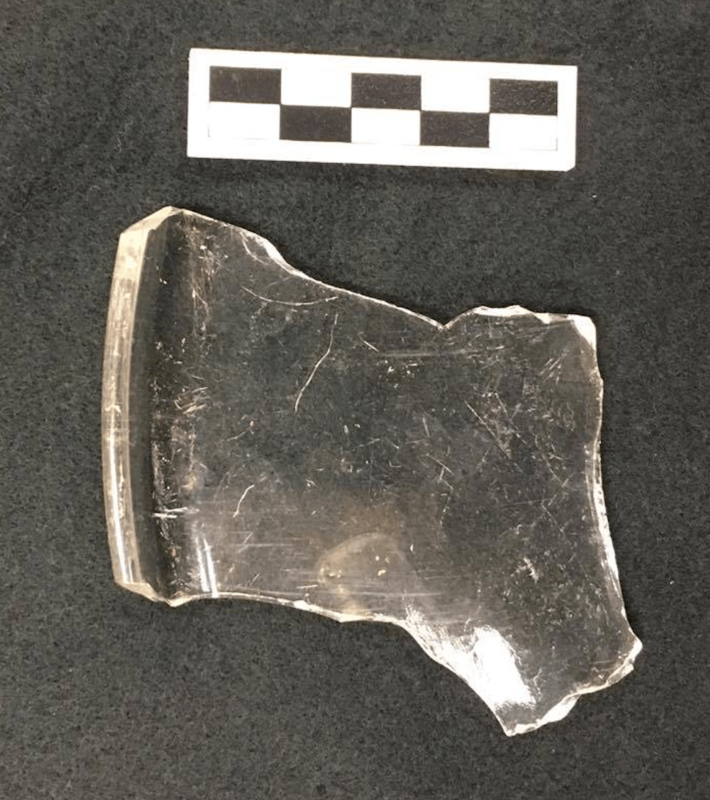 Fragment of a glass plate recovered from the Gunson/Admin Site. Cake has undoubtedly played a significant role in the history of MSU, acting as a symbol of celebration, community, friendship, leisure, and even defiance in both the public and private lives of student and faculty alike. With the popularity of Sesquicentennial Swirl, the vast array of cakes available in the cafeterias, and the gorgeous creations of the MSU Bakers for birthdays and graduations, I think cake will continue to be an iconic treat on campus for a very long time. Well, that’s enough from me. Writing this blog has made me hungry, so I’m going to follow in the footsteps of my MSU predecessor’s and go eat some cake! Byrn, Anne. American Cake: From Colonial Gingerbread to Classic Layer, the Stories and Recipes Behind More Than 125 of Our Best-Loved Cakes. New York: Rodale, 2016. Kains, Maurice G., editor. Fifty Years out of College: A Composite Memoir of the Class of 1895 Michigan State College of Agriculture and Applied Science. New York: Greenberg, 1945. You heard me wax poetic about dairy and the history of dairy production in my previous blog. However, as I pointed out then, the importance of dairy at MSU lies not only in the delicious cheese and ice cream produced but also in dairy education and research. 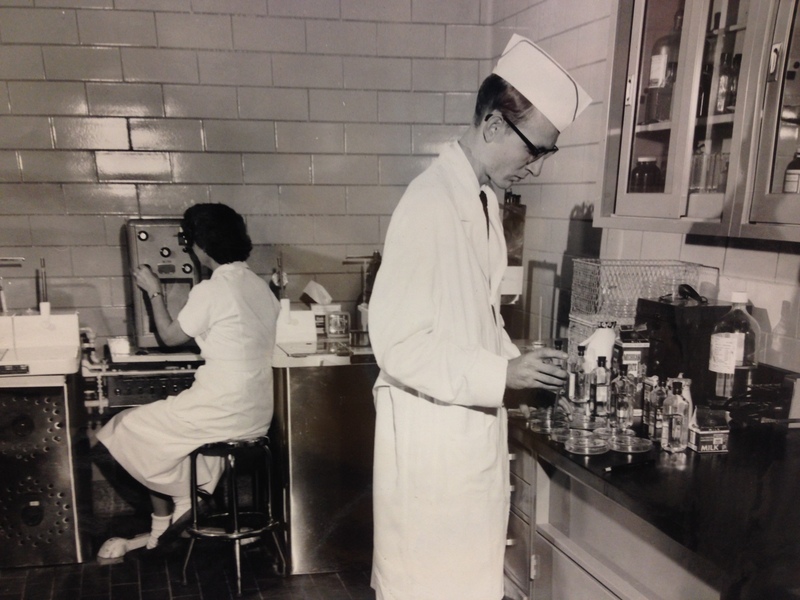 The Dairy Department, and now jointly the Department of Food Science and Nutrition and the Department of Animal Science, have carried on a tradition of instruction of students, research, and outreach since the founding of MSU. No official courses on dairying were taught in the earliest days of the College, although its tenets and techniques were incorporated into more general instruction. Professor Peter M. Harwood was first to bear the title of Instructor in Dairying, which he received in 1892, but was succeeded in 1983 by Clinton D. Smith. Smith strongly believed in the potential for Michigan to develop a strong dairy industry and therefore offered the first dairy course at the college in the winter of 1894/1895. These early courses were taught in the basement of the Agricultural Laboratory, which is now known as Cook Hall. 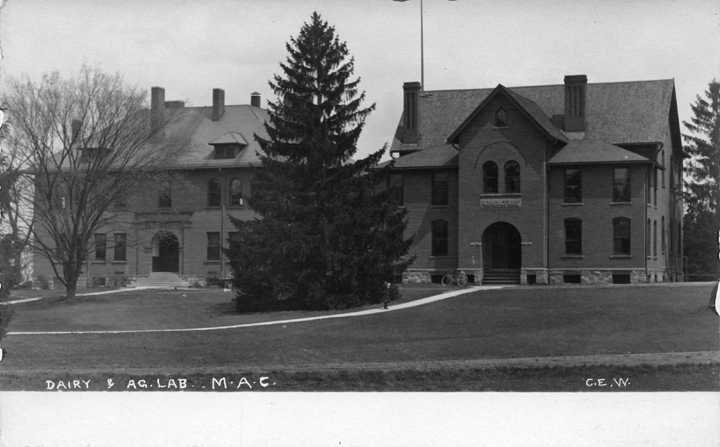 A new building, which housed both Dairy and Forestry classes, was built in 1900, modern-day Chittenden Hall. In 1910, courses offered included Elementary Dairying, Creamery Butter Making, Cheese Making, and Market Milk (Anthony 1929). 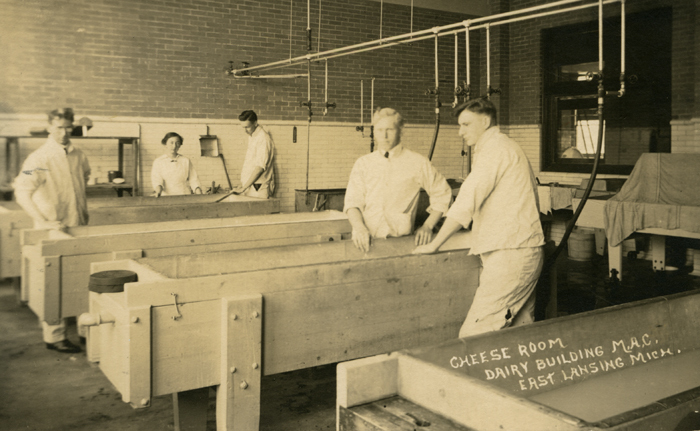 Cheese-making class, 1915. Image courtesy of MSU Archives & Historical Collections. 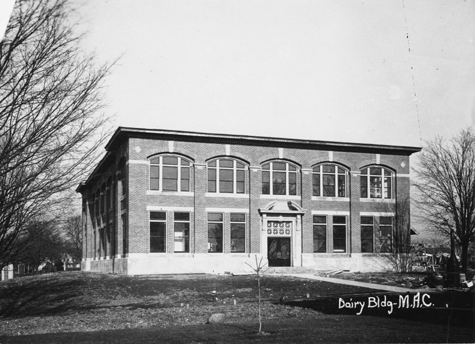 Dairy Science Building, no date. Image courtesy of MSU Archives & Historical Collections. The Dairy Department (later called the Department of Dairy Science) was ultimately absorbed by the Dept. of Food Science and Nutrition and the Dept. of Animal Science. Today among the only courses specific to dairy foods is FSC 432 Food Processing: Dairy Foods, and the general principals of food science are taught in courses such as Food Safety, Food Chemistry, and Food Microbiology, and Food Engineering. Animal Science offers courses in Dairy Farm, Herd, Feed, and Cattle Management; Diary Cattle Judging; Dairy Growth, Health and Lactation in Dairy Cattle; just to name a few. 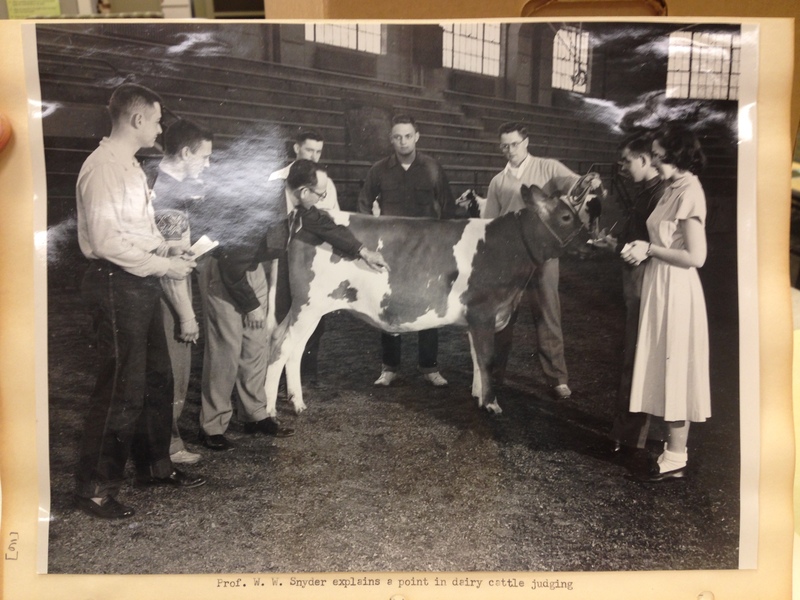 Research has also been important component of the dairy curriculum at MSU. In 1896, Dr. Charles E. Marshall arrived at the college and became a pioneer in the field of bacteriology, all through his research on the bacteriology of milk (Anthony 1929:3-4). 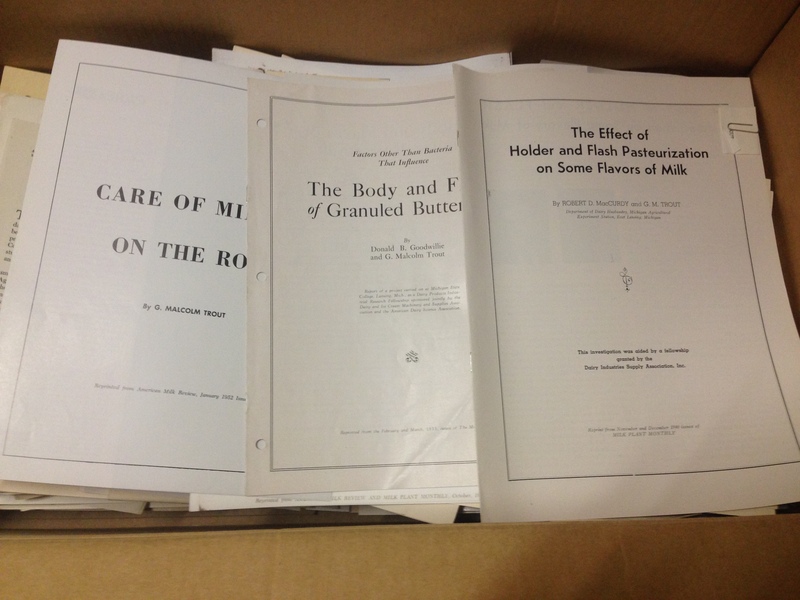 Early faculty and students also conducted extensive work in dairy cattle breeding (Anthony 1929:10). Malcolm Trout, a professor at Michigan State between 1928 and 1966, discovered how to homogenize milk by linking it to the process of pasteurization, the combined techniques which are integral to commercial milk sales. C. F. Huffman was a leader in the field of the effects of animal nutrition on production, while research and publications on market milk and ice cream were also spearheaded by the department (Trout 1955). 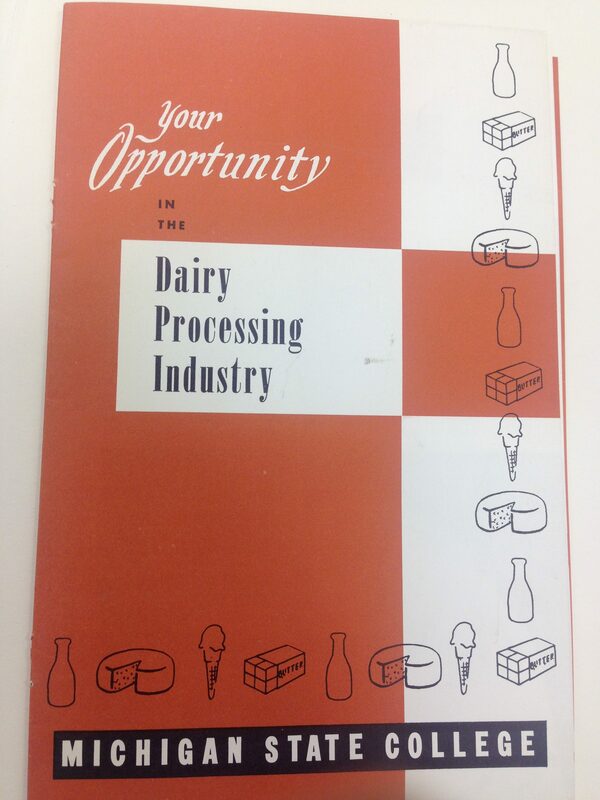 Dairy recruitment brochure, date unknown (UA 16.37, Box 521, Folder 9). Much of the current research conducted within the Department of Food Science and Nutrition now focuses to expand the use of underutilized commodities, using by-products of the meat and dairy processing industries; and to determine how the biochemical and physical properties of foods influence their quality and safety. The Animal Science department researches bovine lactation biology, including regulation and manipulation of ruminant lipid metabolism and the impact of milk on human health. Outreach and collaboration with local Michigan farmers has also been a priority of the dairy department. Dissemination of latest developments by researchers both at Michigan State and elsewhere through farmers’ institutes has a history extending back to 1871 (Trout 1955). 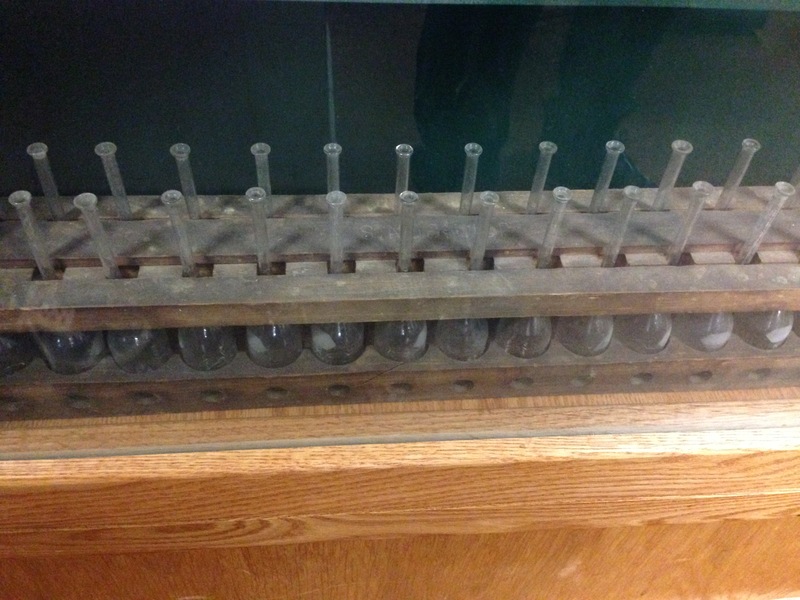 The Babcock test, a method for testing milk fat content which was developed at the University of Wisconsin, was brought to farmers in 1892 and demonstrated the need for quality control of milk products (Anthony 1929). Also part of the diary extension work has been the development of Michigan’s farm youth through organizations such as 4H and Future Farmers of America (FFA) (Trout 1955). Today, MSU is active in outreach with the Michigan Dairy Youth Program and 4H, and the Dairy Extension program is still active in engaging with the public and with dairy educators across the state. They have also added online resources, bringing outreach into the modern age. 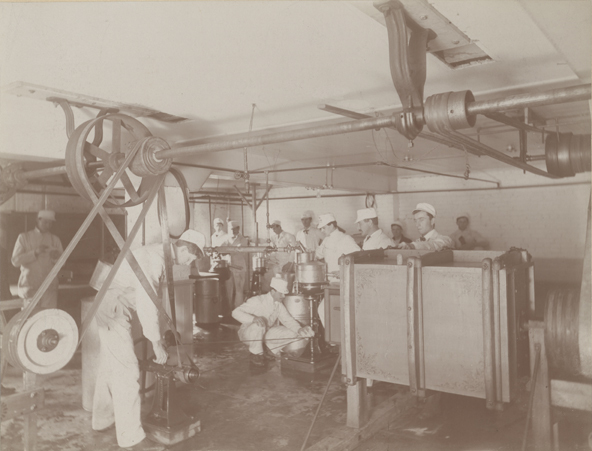 Michigan State University has not only been a center of production for dairy products, but perhaps more importantly has played a central role in scientific innovation for improving food safety standards, food production, and production and manufacturing efficiency. It has also served to utilize this research by educating students in both the practical and scientific aspects of dairying and production and by disseminating new information to farmers across the state. So next time you sit down and eat your Dairy Store ice cream, take the time to appreciate all that past MSU researchers and educators have done to make it safe and… udderly delicious. Madison Kuhn Collection.  UA17.107, Folder 3, Box 2411. 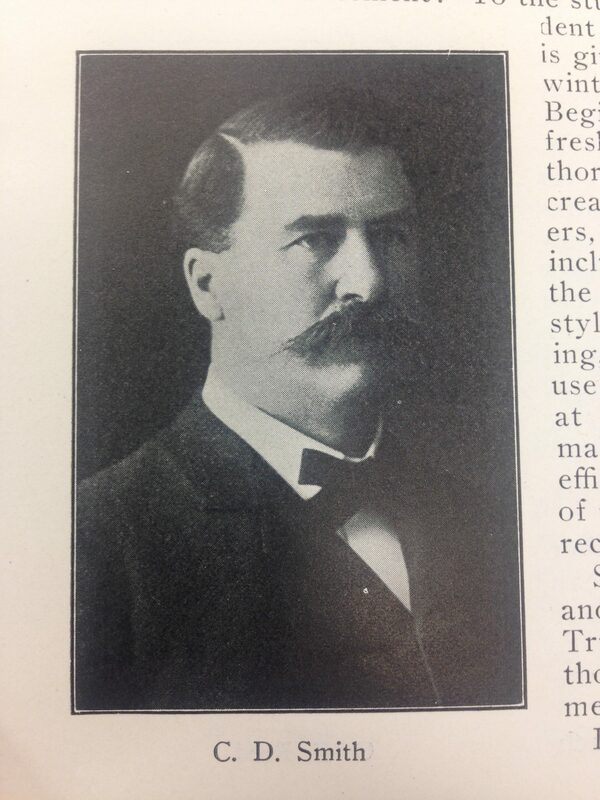 L. Anthony, History of Dairy Development at MSC, 1929. Malcolm Trout, Two Hundred and Fifty Years of Michigan Dairying,1955.